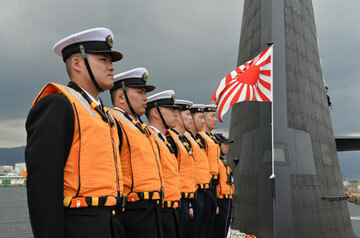 The new diesel-electric attack submarine was handed over to the Japan Maritime Self-Defense Force last week. Last week, the Japan Maritime Self-Defense Force (JMSDF) commissioned its seventh Soryu-class diesel-electric attack stealth submarine, christened the JS Jinryu, at a ceremony held at the Mitsubishi Heavy Industries (MHI) Kobe Shipyard & Machinery Works in Kobe, Hyogo Prefecture in central Japan, according to a MHI press release. The commissioning ceremony was attended by senior Japanese defense officials including State Minister of Defense Kenji Wakamiya, JMSDF Chief of Staff Tomohisa Takei, and Acquisition, Technology and Logistics Agency Commissioner Hideaki Watanabe. The JS Jinryu is the seventh Soryu-class submarine delivered to the JMSDF and the fourth built by MHI. (Other ships were built by the Kawasaki Shipbuilding Corporation.) “MHI also built the first Soryu-class submarine, and has produced a total of 26 submarines at the MHI Kobe Shipyard over the last 70 years,” the MHI press statement reads. The keel for the JS Jinryu was laid in February 2012. The vessel was launched in October 2014. Overall, the JMSDF plans to induct a total of 11 Soryu-class submarines by 2020. With 4,100 tons submerged, the Soryu-class is larger than any other sub class in service with the JMSDF and is Japan’s first class of air-independent propulsion submarines. The JS Jinryu is powered by two Kawasaki 12V 25/25 SB-type diesel engines and four Kawasaki Kockums V4-275R Stirling engines and has a range of 6,100 nautical miles (11297 kilometers) with a maximum surface speed of 13 knots and a submerged speed of 20 knots. It is unclear whether the JS Jinryu will also be equipped with advanced lithium-ion batteries (the design of which is one of Japan’s top military secrets) in order to improve the submarine’s underwater endurance. Japan’s Ministry of Defense announced last year that it plans to equip all future Soryu-class subs with lithium-ion batteries. The Soryu-class ships’ hydrodynamic design is based on the older Oyashio-class diesel-electric attack submarines currently in service with the JMSDF. It is also fitted with a computer-controlled, Swedish-designed X rudder to increase the ship’s maneuverability when operating in shallow waters close to the seabed. According to naval.technologies.com, the ship’s “hull form is made of high tensile steel and is covered with anechoic coating to reduce the reflection of acoustic waves.” It also features “acoustic isolation of loud components, while the design incorporates highly automated systems.” The vessel’s crew consists of 9 officers and 56 enlisted men. The JS Jinryu is fitted with six HU-606 533mm torpedo tubes that can accommodate Type 89 homing torpedoes and UGM-84 Harpoon anti-ship missiles. As I reported last week, the JMSDF will dispatch a Soryu-class diesel-electric attack submarine to Sydney next month to participate in a joint naval exercise with the Royal Australian Navy and Royal Australian Air Force in order to boost Japan’s chances to win a major defense contract in Australia (See: “Japan’s Deadliest Sub to Join Australia’s Navy in Military Drill”). The new super quiet diesel electric attack submarine was handed over to the Japanese navy this week. Japan Commissions 10th Soryu-Class Diesel-Electric Attack SubmarineJapan to Commission 10th Soryu-Class Attack Sub This MonthJapan Commissions One of the World's Most Advanced Attack SubsJapan Launches 10th Advanced High-Tech Attack SubDid Japan Just Lose the Bid to Build Australia's New Subs?